Hollywood takes another hit as we see iconic silver screen legend, Bill Paxton, pass away due to heart surgery complications on February 25th. As difficult as it is to have conversations about how and where you want to spend your final days or who inherits your belongings after you die, the sudden passing of Bill is another example that no time is too soon to plan out your final wishes. Bill Paxton’s heart surgery was on his calendar for weeks. Reports are saying Bill was “nervous” and “worried” about his impending heart surgery, as anyone would be. Ideally, he used his time to make sure he had a solid plan for what will happen with his $30 million net worth and how it will affect both his wife and two children Lydia, 19, and James, 23. Without the proper preparations in place that’s enough money to sink anyone’s ship, no iceberg needed. Advance Health Care Directive – This health care directive lets someone you put in charge make medical decisions on your behalf when you are no longer able to do so. 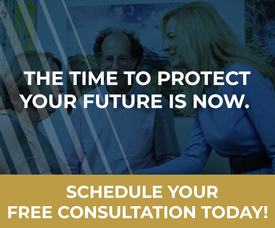 Your doctor will determine when you are no longer able to make your own decisions regarding medical care, and then your trusted agent will take over. You can also detail how you want your medical treatments and end-of-life care handled. For example, whether you want to be kept alive at all costs or prefer not to be resuscitated. Without this directive, your family could end up having serious disagreements or someone who doesn’t share your family’s values could end up in charge, giving you treatments you may not have even wanted. HIPAA – Those named in your HIPAA have access to your private medical records. This could be the same person named in your health care directive or other friends and family who you may want to evaluate options on your behalf. Last Will and Testament and Revocable Living Trust– These work together to specify what happens to your assets if you become incapacitated or after you die for example, who receives your home, savings, investments, jewelry, boat etc. Most importantly, a will appoints guardianship to children who are minors. Without a revocable living trust, the court becomes involved in determining who receives what assets. Legal and Financial Power of Attorney – This gives someone you appoint the right to access all or some of your finances if you become incapacitated. Maybe you want someone to help with paying bills or taxes when you can no longer handle it, this puts that named person in charge. Again, failing to appoint someone can end up costing your family a lot of time and money in court and end up appointing someone you may not want in charge. 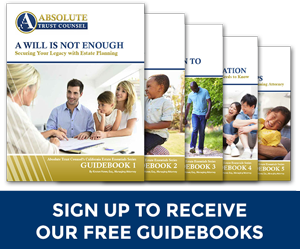 Once you have drafted and signed all the necessary components of your estate plan, obtain a few copies and keep them in a safe place. 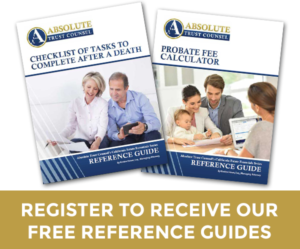 You may even want to include a letter of instruction, which isn’t a legal document but may help guide your loved ones during their time of grief and may provide further information on funeral preparations.